5477, USED RIM, 18X7-1/2, 5 LUG, 105MM, 11-12, CHEV, CRUZE, ALUM, 5 DOUBLE SPOKE, HYPER SILVER. 6025a, Hubcap used, 17", 07-09, SATURN, AURA, HYPER SILVER 5 SPOKE, ENGRAVED LOGO, 5 GKE, ENGRAVED LOGO, 5 GRAY LUG NUT CAPS. CAP HELD ON BY LUG NUTS. 65288b, USED RIM, 17X7-1/2, 5 LUG, 112MM, 04-09, MERCEDES, C CLASS, 203, CLK, 209, 320, C CLASS, 230, 203, 320, 350, ALUM, HYPER SLIVER, 5 SPOKE. 65332, Used Rims, 17X8, 5 LUG, 112mm, 04-05, MERCEDES, E-CLASS, 211 TYPE, E500, HYPER SILVER, ROAD WHEEL, 5 DOUBLE SPOKE, ALLOY. 65332, Used Rims, 17X8, 5 LUG, 112mm, 04-05, MERCEDES, E-CLASS, 211 TYPE, E500, HYPER SILVER, ROAD WHEEL, 5 DOUBLE SPOKE, ALLOY. CENTER CAP SOLD SEPARATE. 69305c, CENTER CAP USED, 86-94, TOYOTA, 4 RUNNER, P/U, BLACK PLASTIC WITH 6 SMALL RIVETS & HYPER SILVER & TOYOTA LOGO ON EMBLEM, 6 LUG NUTS CUT OUT, 6 METAL CLIPS, 5" DIA. FOR A 15", RIM. 69440a-2c, CENTER CAP COPY, 03-07, TOYOTA, TUNDRA, SEQUOIA, HYPER SILVER, 6 LUG STYLE, COMPARE LUG NUTS STYLE BEFORE INTER CHANGE, 5-1/2" DIA. 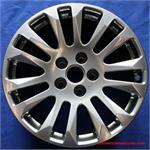 69484, Used Rims, 17X7, 5 LUG, 4-1/2", 05-07, TOYOTA, AVALON, 8 SPOKE, HYPER SILVER, ALLOY. 70771a, CENTER CAP USED, 09-11, HYUNDAI, GENESIS, HYPER SILVER PLASTIC CAP, DARKER SILVER CENTER WITH CHROME LOGO, 5 PLASTIC CLIPS, STAR WIRE, 6-1/8"
70771a, CENTER CAP USED, 09-11, HYUNDAI, GENESIS, HYPER SILVER PLASTIC CAP, DARKER SILVER CENTER WITH CHROME LOGO, 5 PLASTIC CLIPS, STAR WIRE, 6-1/8" DIA. 72165, CENTER CAP USED, 03-05, RANGE ROVER, HYPER SILVER PLASTIC CAP, OVAL CENTER, GREEN BACKGROUND, GOLD WORD LAND ROVER, 2-3/8" DIA. 72165, Used Rims, 18X7-1/2, 5 LUG, 120MM, 03-05, ROVER, RANGE ROVER, 5 DOUBLE SPOKES, HYPER SILVER. 73662b, CENTER CAP USED, 02-04, INFINITY, I35, HYPER SILVER, 8 RAISES MATCH SPOKES, ONE WITH REMOVAL NOTCH, RAISED CHROME LOGO, 6-1/4" DIA. 73700b, CENTER CAP USED, 08-10, INFINITI, EX35, METALLIC FINISH HYPER SILVER, PLASTIC CAP, RAISED CHROME LOGO, 8 RAISES MATCH SPOKES, 5-7/8" DIA. 73700b, CENTER CAP USED, 08-10, INFINITI, EX35, [METALLIC FINISH] HYPER SILVER PLASTIC CAP, RAISED CHROME LOGO, 8 RAISES ON OUTER EDGE TO MATCH SPOKES, 5 PLASTIC CLIPS, WIRE RING, 5-7/8" DIA. 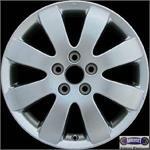 FOR A 18" RIM, ALSO FITS 73689 CENTER CAP A= SILVER FINISH.